April 2019 e-newsletter out now. Our monthly e-newsletter is out now, with news of forthcoming services, music and other events. If you'd like to receive a copy of this regularly, please send your email address to info@stmaryschurchbrighton.org.uk and we'll add you to the mailing list. We won't pester you with anything else, we promise. Click here to read the April 2019 edition. Click here to catch up on the February 2019 edition. We are delighted to announce that Richard, Bishop of Lewes inducted Fr Andrew Woodward as the Vicar of St Mary's, Kemp Town on Sunday, 17 March 2019. As many of you will know, Fr Andrew has been our priest-in-charge for over 11 years, having offered his services to St Mary's for free in 2007 when we were facing almost certain closure. His licensing as our Vicar was a marvellous occasion to honour his hard work, love and dedication in turning around the fortunes of our beautiful church. Thank you to all who shared in this happy occasion. Thank you to all who took part and attended this special event on 18 November 2018. Thanks to your generosity we raised £350 to share between Blind Veterans UK and Samara's Aid Appeal. St Mary’s Church is delighted to announce a grant of £232,200 from the Heritage Lottery Fund towards the cost of major building repairs to its entrance frontage overlooking St James’s Street in Brighton. The Grade II*-listed parish church, which was built in 1878, stands one block from the sea and over the decades has suffered serious wind and salt erosion to its historic red brick and sandstone fabric. The grant provides major support for urgent repairs to the south elevation, which are projected to cost £360,000. The repairs will completely renovate the entrance frontage of the church and provide new lighting and signage and the removal of pavement trip hazards at the doors. Work is expected to commence next month and to be completed by February 2019. ‘It’s our 140th birthday this year and we couldn’t have asked for a better present! We are thrilled to receive this grant from the Heritage Lottery Fund and wish to thank the National Lottery players who make this vital support for historic buildings possible. Congratulations to our new priest! Congratulations to Fr Herbert Bennett on his priesting at Holy Cross, Uckfield, on 10 June 2017. We had a beautiful celebration mass at St Mary's on the following day, attended by many of Fr Herbert's friends and family members. And we're very happy to report that Fr Herbert will serve with us as our curate at St Mary's for the next three years. Click on our Facebook link below to see some images from the weekend. We are thrilled and thankful to announce that St Mary's Church has received almost £273,000 from four major trusts to carry out urgent repairs to the west-facing elevation of the church, overlooking Upper Rock Gardens. The works comprise the comprehensive repair of the roofs, rainwater goods, underground drainage, brickwork, masonry and windows. We hope by Christmas to be able to show off a smarter, brighter church on Upper Rock Gardens for the benefit of our neighbours and visitors. 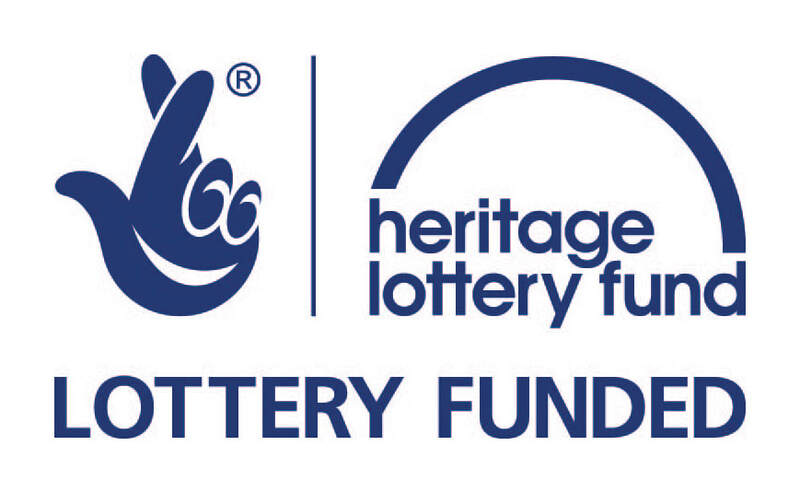 The Heritage Lottery Fund is our major funder and has granted us £216,300 under its Grants for Places of Worship. This follows on from a development grant of £17,000 the HLF gave us last year to cost and plan these works. We are profoundly grateful to the HLF for its advice and support and take seriously our obligations to preserve and care for St Mary's as a part of the nation's built heritage. We are using the works to raise people's awareness of the beauty and history of St Mary's and hope particularly to introduce more visitors to it via our neighbourhood history exhibition which we'll be launching as part of our HLF activities on the weekend of 19/20 November this year. The HLF's core funding has been generously supplemented by a £40,000 Cornerstone Grant from the National Churches Trust, one of only three given out in the UK in this round of funding. 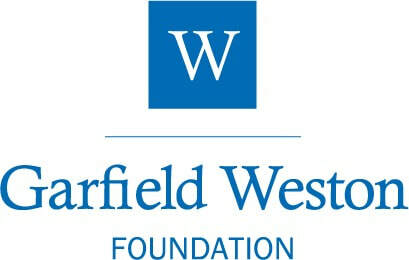 Plus the Garfield Weston Foundation has generously awarded us £10,000 and the Sussex Historic Churches Trust has added £6,500 to the pot! We are hugely appreciative of all these grants, as each of them represents a substantial donation from the funds that each trust has available for these purposes. We're also putting in almost £25,000 from our own resources, including ongoing fundraising. If you would like to contribute to these repairs, the Friends of St Mary's are running an appeal for one of the most damaged windows and would welcome your interest and support. You can also read more about our future repair and development plans here. For further information, please contact Katherine Prior via email or on 07796 440 670. 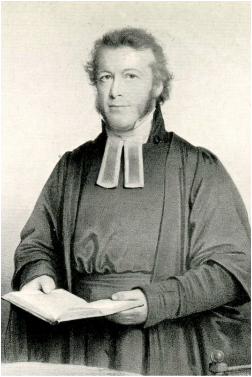 The Revd Henry Venn Elliott died 150 years ago, on 24 January 1865, just a week after his 73rd birthday. He was the first incumbent at old St Mary's Chapel, serving there for 38 years from its opening in 1827 until his death. Elliott had a big impact on the life and indeed the buildings of Brighton. Under his leadership, St Mary’s became one of the most fashionable chapels in Brighton, and drew preachers and churchgoers from around Britain and far-flung bits of its empire. In the course of his work he founded St Mary’s Hall (1836), a school for the daughters of poor clergy - one of the earliest girls' schools in Britain - as well as its associated church, St Mark’s (1838). He was also one of four founder-directors of Brighton College (1845), the college's founder, William Aldwin Soames, being a worshipper at St Mary's. In an era when Brighton's church politics were convulsed by the rise of Anglo-Catholicism, Elliott was on the other side - a leading Evangelical. But that label had subtly different connotations then to current usage. Victorian Evangelicals were the political liberals of their day, activists at the forefront of campaigns against slavery and the exploitation of indigenous peoples and keen advocates of the education of Britain's working poor. Elliott was a passionate supporter of the Church Missionary Society, founded by his uncle John Venn, driven by a belief that all humans were fundamentally equal and equally loved by God. More conservative voices within the Church scorned the idea that Africans or Indians could become 'real' Christians. There are many things - most, probably - that we wouldn't do in Henry Venn Elliott's way in 2015. A devout opponent of Sunday entertainments and church theatricals, he'd certainly disapprove of the shows we host in St Mary's these days. And he would be very uncomfortable with the vestments, the incense, the bells... But nonetheless there remains much to inspire us in his hope-filled, inclusive theology. We can respect and learn from the past without having to worship it uncritically. 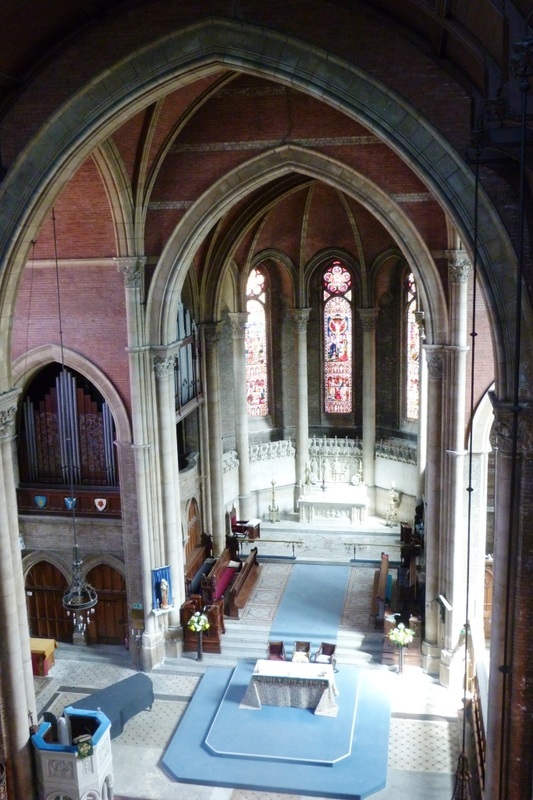 View of St Mary's interior, taken from scaffolding erected to repair the clerestory windows in the nave gable, April 2015. The ﻿font and Paschal candle. Photo Jean-Luc Brouard.